Get YOUR script worked on live in this session. So you have completed your script and it’s incredible… You send it off to producers and directors. 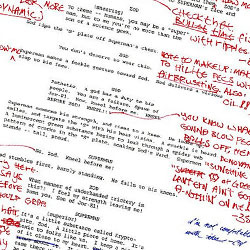 But how do filmmakers actually read your script? What will they do to it? How can you protect it? In this live demonstration, we will attack a script like a filmmaker, giving you an insight into how better to polish your work before it is sent to the producers. It will also give you an insight into why changes that often seem random or unnecessary, get made, and why YOU should collaborate with the production team and not fight. While the writers will be in the room, we will work on the script as though they were not present, giving you a window into what really happens when you hand the script over. We want to thank the brave souls who have offered their work up in advance. Fortune favours the bold! Bionic blogger, script editor and the voice of new writers! Legendary for her enthusiasm and knowledge which she shares with her community at Bang2Write. Core member of the LSF team. How nice to be able to ask questions and have a conversation in a non-stressful environment.